The Prestwick Golf Club is founded. Pau Golf Club is founded, the first on the Continent. “The Golfer’s Manual”, by “A Keen Hand” (H. B. Farnie), is published. It is the first book on golf instruction. The Royal Curragh Golf Club is founded at Kildare, the oldest golf club in Ireland. The format of the Championship Meeting is changed to individual match play and is won by Robert Chambers of Bruntsfield. The King James VI Golf Club is founded in Perth, Scotland. The first Amateur Championship is won by George Condie of Perth. The Prestwick Club institutes a Professional Championship played at Prestwick; the first Championship Belt is won by Willie Park, Sr. The Professionals Championship is opened to amateurs, and The Open Championship is born. The first competition is won by Old Tom Morris. The North Devon Golf Club is founded at Westward Ho! The Ladies’ Golf Club at St. Andrews is founded, the first golf club for women. The Liverpool Golf Club is founded at Hoylake, later Royal Liverpool. Young Tom Morris, age 17, wins the first of four successive Open Championships. His streak would include an 11-stroke victory in 1869 and a 12-stroke victory in 1870 (in a 36-hole format). His 149 in the 1870 Open over 36 holes is a stroke average that would not be equaled until the invention of the rubber-cored ball. Young Tom Morris wins his third consecutive Open Championship, thus winning permanent possession of the Belt. The Otago Golf Club is formed, the first club in New Zealand. The Open Championship is reinstituted when Prestwick, St. Andrews and the Honorable Company of Edinburgh Golfers offer a new trophy, with the Open Championship to be hosted in rotation by the three clubs. Young Tom Morris wins his fourth consecutive Open Championship. The Christchurch Golf Club is formed, the second club in New Zealand. The Royal Montreal Golf Club is formed, the oldest surviving golf club in Canada and North America. The Open Championship is held for the first time at the Old Course. The Royal Quebec Golf Club is formed in Quebec City, and remains the second oldest surviving golf club in Canada and North America. The Oxford and Cambridge University Golf Clubs are founded. Young Tom Morris dies at age 24. He did not emotionally recover from the death of both his wife and their daughter in childbirth earlier that year. The Toronto Golf Club is established, the third oldest golf club in Canada and North America. Originally located on the Fernhill property in Toronto, the Club moved to its current location on the banks of the Etobicoke River in 1911. Jamie Anderson wins the first of three consecutive Open Championships. The first University Match is played on the London Scottish Golf Club course at Wimbledon, won by Oxford. The use of moulds is instituted to dimple the gutta-percha ball. Golfers had long noticed that the guttie worked in the air much better after it had been hit several times and scuffed up. Bob Ferguson of Musselburgh, losing The Open in extra holes, comes one victory shy of equaling Young Tom Morris’ record of four consecutive titles. Ferguson ends up later in life penniless, working out of the Musselburgh caddy-shack. The Edgewood Club of Tivoli is founded in Tivoli, New York with two golf holes. The course was incrementally expanded to nine holes by 1916. This club is the oldest existing U.S. golf club with continuous golf in the same location. The Amateur Championship is first played at Royal Liverpool Golf Club, Hoylake. The London Metal Exchange Golf Association (LMEGA) is formed. The Royal Cape Golf Club is founded at Wynberg, South Africa, the first club in Africa. John Hamilton Gillespie lays out a two-hole golf course in Sarasota, Florida. A.J. Balfour is appointed Chief Secretary (Cabinet Minister) for Ireland; his rise to political and social prominence has an incalculable effect on the popularity of golf, as he is an indefatigable player and catalyzes great interest in the game through his writing and public speaking. Alexander H. Findlay, later to become the Father of American Golf, was the first in the world to score a 72 in competition for 18 holes at the Mercantile Golf Club in Montrose, Scotland. “The Art of Golf” by Sir Walter Simpson is published. The Quogue Field Club was founded in Quogue, New York. The original course had 18 holes, but after the Hurricane of 1938 the club lost 3 holes to the bay and had to reduce the course to 9 holes from that point forward. The Foxburg Country Club is founded in Foxburg, Pennsylvania. The Town & Country Club is founded in St. Paul, Minnesota. The St. Andrew’s Golf Club, consisting of a three hole course, is founded in Yonkers, New York. John Ball, an English amateur, becomes the first non-Scotsman and first amateur to win The Open Championship. Bogey is invented by Hugh Rotherham, as the score of the hypothetical golfer playing perfect golf at every hole. Rotherham calls this a “Ground Score,” but Dr. Thomas Brown, honorary Secretary of the Great Yarmouth Club, christens this hypothetical man a “Bogey Man,” after a popular song of the day, and christens his score a “Bogey.” With the invention of the rubber-cored ball golfers are able to reach the greens in fewer strokes, and so bogey has come to represent one over the par score for the hole. The Golfing Union of Ireland is founded on 12 October 1891 and is the oldest Golfing Union in the world. Shinnecock Hills Golf Club is founded on Long Island. The Oakhurst Golf Club is founded at White Sulphur Springs, West Virginia. It hosted the Oakhurst Challenge, the oldest known golf tournament in the U.S. The Oakhurst Challenge Medal is recognized as the oldest known prize for golf in the U.S. The first hole at The Homestead survives from this course and is the oldest surviving golf hole in America. Palmetto Golf Club established in Aiken, South Carolina. Glen Arven Country Club golf course established in Thomasville, Georgia USA; the oldest course still in use in Georgia. Gate money is charged for the first time, at a match between Douglas Rollard and Jack White at Cambridge. The practice of paying for matches through private betting, rather than gate receipts and sponsorships, survives well into the 20th Century as a “Calcutta,” but increasingly gate receipts are the source of legitimate prize purses. The Ladies’ Golf Union of Great Britain and Ireland is founded and the first British Ladies Amateur Golf Championship won by Lady Margaret Scott at Royal Lytham & St Annes Golf Club. The Irish Ladies’ Golf Union is founded and is the oldest Ladies Golf Union in the world. The Chicago Golf Club opens the United States’ first 18-hole golf course on the site of the present-day Downers Grove Golf Course. The Chicago Golf Club moved to its current location in 1895. Victoria Golf Club is formed and remains the oldest course west of the Mississippi on its original site. The Segregansett Country Club opens in Taunton, Massachusetts. This course is still in operation. The Open is played on an English course for the first time and is won for the first time by an Englishman, J.H. Taylor. Taylor, along with Harry Vardon and James Braid (together known as the Great Triumvirate) would dominate the Open Championship for the next two decades. The United States Golf Association is founded as the Amateur Golf Association of the United States. Charter members are the Chicago Golf Club, The Country Club, Newport Country Club, St. Andrew’s Golf Club, and Shinnecock Hills Golf Club. 1894 The Otsego Golf Club, Springfiled Center, NY, officially opened with 12 holes. Founded by Henry L. Wardwell and Leslie Pell-Clarke, the Otsego Golf Club has operated continuously since 1894 and is a nine hole course today. Tacoma Golf Club is founded, the first golf club on the US Pacific Coast. The U.S. Amateur is instituted, with Charles B. Macdonald winning the inaugural event. The first U.S. Open is held the following day, with Horace Rawlins winning. July 6, 1895 – Van Cortlandt Park Golf Course opens – the first public golf course in America. The U.S. Women’s Amateur is instituted. Mrs. Charles S. Brown (née Lucy N. Barnes) is the first winner. Harry Vardon wins his first British Open. The first NCAA Championship is held. Louis Bayard, Jr. is the winner. “Golf”, America’s first golfing magazine, is published for the first time. Freddie Tait, betting he could reach the Royal Cinque Ports Golf Club clubhouse from the clubhouse at Royal St George’s Golf Club – a three mile distance – in forty shots or less, puts his 32nd stroke through a window at the Cinque Ports club. Church Stretton Golf Club is founded, the oldest 18-hole course in Shropshire and one of the highest courses in England and the United Kingdom. The Western Open is first played at The Glen View Club in Golf, Illinois, the first tournament in what would evolve into the PGA Tour. Vesper Country Club is formed in Tyngsboro, Massachusetts. Walter Travis wins the first of his three U.S. Amateurs. Harry Vardon wins the U.S. Open, the first golfer to win both the British and U.S. Opens. The PGA – Professional Golfers’ Association (Great Britain & Ireland) is established. Walter Travis wins his second U.S. Amateur, and becomes the first golfer to win a major title with the Haskell ball, the first rubber-cored golf ball. When Sandy Herd wins the British Open and Laurie Auchterlonie the U.S. Open the next year with the Haskell, virtually all competitors switch to the new ball. The first course at the Carolina Hotel (later the Pinehurst Resort & CC) in Pinehurst, North Carolina, is completed by Donald Ross. Ross will go on to design 600 courses in his storied career as a golf course architect. Walter Travis publishes his first book, “Practical Golf”, a tome that received a rave review in the New York Times. England and Scotland inaugurate an Amateur Team competition, with Scotland winning at Hoylake. Walter Travis becomes the first three-time U.S. Amateur champion. Walter Travis becomes the first American to win the British Amateur using the center-shafted, Schenectady putter. Golf makes its second and final Olympic appearance at the Olympic Games in St. Louis. John Hamilton Gillespie opens a nine hole course in Sarasota. Women golfers from Britain and the United States play an international match, with the British winning 6 matches to 1. “The Complete Golfer” by Harry Vardon is published. It promotes and demonstrates the Vardon or overlapping grip. The Toronto Golf Club hosts the Canadian Open and then again in 1909, 1914, 1921 and 1927. Goodrich introduces a golf ball with a rubber core filled with compressed air. The “Pneu-matic” proves quite lively, but also prone to explode in warm weather, often in a golfer’s pocket. The ball is eventually discontinued; at this time the Haskell ball achieves a dominance of the golf ball market. Arnaud Massy becomes the first golfer from Continental Europe to win The Open Championship. Mrs. Gordon Robertson, at Princes Ladies GC, becomes the first female professional. “The Mystery of Golf” by Arnold Haultain is published. The golf magazine “The American Golfer” is launched by Walter Travis. A dispute over the format of the competition leads to the cancellation of the golf tournament at the 1908 Summer Olympics. The Great Southern Golf Club was the first golf course was in Mississippi. Fort Wayne Country Club in Fort Wayne, IN was formed. The USGA rules that caddies, caddy masters and green keepers over the age of sixteen are professional golfers. The ruling is later modified and eventually reversed in 1963. The R & A bans the center-shafted putter while the USGA keeps it legal – marking the beginning of a 42-year period with two official versions of The Rules of Golf. John McDermott becomes the first native-born American to win the U.S. Open. At 17 years of age, he is also the youngest winner to date. John Ball wins his eighth British Amateur championship, a record not yet equaled. Francis Ouimet, age 20, becomes the first amateur to win the U.S. Open, defeating favorites Harry Vardon and Ted Ray in a play-off. The first professional international match is played between France and the United States at La Boulie Golf Club, France. Formation of The Tokyo Club at Komozawa kicks off the Japanese golf boom. Harry Vardon wins his sixth Open Championship, a record to this day (Peter Thomson and Tom Watson have since won five Opens each). The Open Championship is discontinued for the duration of the First World War. The PGA of America is founded by 82 charter members and the PGA Championship is inaugurated. Jim Barnes is the first champion. The PGA Championship and the U.S. Open are discontinued for the duration of the First World War. The R & A assumes control over The Open Championship (British Open) and The Amateur Championship (British Amateur). The USGA founds its famed Green Section to conduct research on turfgrass. “The Professional Golfer of America” is first published which, today known as “PGA Magazine”, is the oldest continually-published golf magazine in the United States. A golf tournament is scheduled for the 1920 Summer Olympics in Antwerp but it is ultimately cancelled. The R & A limits the size and weight of the ball. Walter Hagen becomes the first native American to win The Open Championship. He subsequently becomes the first professional golfer to open a golf equipment company under his own name. The Walker Cup Match is instituted. Two direct descendants of Walker Cup founder George Herbert Walker would become President of the United States—his grandson George H. W. Bush, the 41st President, and his great-grandson George W. Bush, the 43rd President. Pine Valley Golf Club opens in New Jersey. The West and East courses at Winged Foot Golf Club in Mamaroneck, New York open for play, designed by A.W. Tillinghast. Joyce Wethered wins her record fifth consecutive English Ladies’ Championship. The USGA legalizes steel shafted golf clubs. 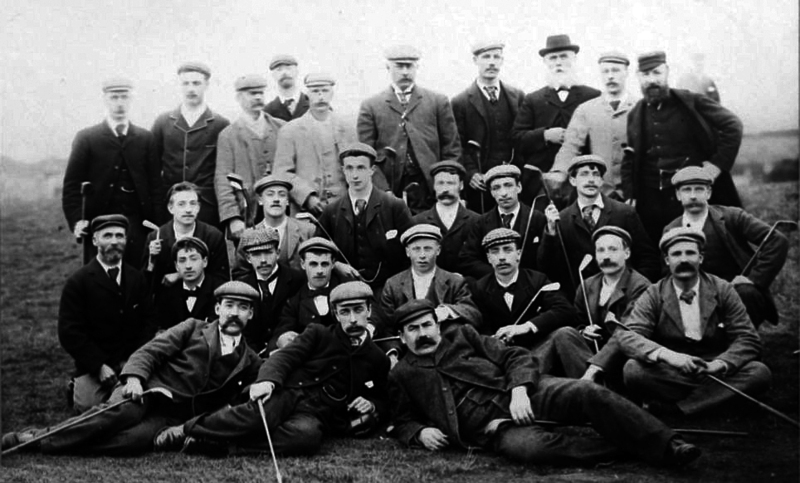 The R & A does not follow suit until 1929, widening the breach in The Rules of Golf. The first fairway irrigation system is developed in Dallas, Texas. Jess Sweetser becomes the first native-born American to win the British Amateur. The Los Angeles Open is inaugurated, the third-oldest surviving PGA Tour event. It is also the first tournament to offer a $10,000 purse. Cypress Point Club opens, designed by Alister MacKenzie. Walter Hagen wins The Open Championship for the fourth time. Seminole Golf Club opens in Palm Beach, Florida, from a design by Donald Ross. Bobby Jones completes the original Grand Slam, winning the U.S. and British Amateurs and the U.S. and British Opens in the same year. Since Jones is an amateur, however, the financial windfall belongs to professional Bobby Cruickshank, who bets on Jones to complete the Slam, at 120-1 odds, and pockets $60,000. Jones, perhaps satisfied that he has achieved all he can in the game, retires from competition aged 28 to practice law full-time (and to found a new club that would become known as Augusta National). Shinnecock Hills Golf Club opens its modern course on Long Island, New York. Bob Harlow is hired as manager of the PGA’s Tournament Bureau, and he first proposes the idea of expanding “The Circuit,” as the Tour is then known, from a series of winter events leading up to the season ending North and South Open in spring, into a year-round Tour. Billy Burke defeats George Von Elm in a 72-hole playoff at Inverness to win the 1931 U.S. Open, in the longest playoff ever played. They were tied at 292 after regulation play, and both scored 149 in the first 36-hole playoff. Burke is the first golfer to win a major championship using steel-shafted golf clubs. The USGA increases the minimum size of the golf ball from 1.62 inches to 1.68 inches, and decreases the maximum weight from 1.62 ounces to 1.55. The R & A does not follow suit. The lighter, larger “balloon ball” is universally despised and eventually the USGA raises the weight back to 1.62 ounces. The first Curtis Cup Match is held at Wentworth in England. Gene Sarazen is credited with the introduction of the sand-wedge. Sarazen wins both the British and U.S. Open titles in 1932, becoming only the second man (after Bobby Jones) to achieve the feat. Walter Hagen wins a fifth Western Open. At the time, and until the 1950s, the Western Open was considered among the most important tournaments, behind only the National Opens and the PGA Championship (of which Hagen won eleven in total) in status. The Prince of Wales reaches the final of the Parliamentary Handicap Tournament. Craig Wood hits a 430 yard (393 m) drive at the Old Course’s fifth hole in the British Open; this is still the longest drive in a major championship. Wood loses a playoff for the championship to Denny Shute. Gene Sarazen finishes third, and later in the year wins the PGA Championship. The Golf Club Managers’ Association is formed in the UK (originally called the Association of Golf Club Secretaries). Two years later it launches Course and Club House magazine (now called Golf Club Management), the third oldest golfing magazine in the world that is still running. The first Masters is played. Horton Smith is the first champion. In this inaugural event, the present-day back and front nines were reversed. Olin Dutra wins the U.S. Open by a shot from Gene Sarazen. Henry Cotton wins his first British Open, at Royal St. George’s, and shoots a 65 in his second round, a feat that was commemorated by the “Dunlop 65” golf ball. Sid Brews, winner of the South African, French and Dutch Opens in 1934, enjoys his best finish at a British Open, in second place. The official U.S. PGA Tour is created, built around events like the major championships, Western Open and Los Angeles Opens which pre-dated it. Paul Runyan is the first official Money List leader. Glenna Collett Vare wins the U.S. Women’s Amateur a record sixth time. Gene Sarazen double-eagles the par-5 15th hole to catch the leaders at The Masters. His “Shot Heard Round the World” propels him to victory, and due to the coverage of his feat, propels both the game of golf and Augusta National to new heights of popularity.